Feng shui is all about balance. The ancient philosophy can be used to create comfortable and tranquil atmosphere. The term has become exceptionally fashionable today, though few people take the time to understand the basics of feng shui. This philosophy is all about the flow of energy. Feng shui can be used to maximize the waves of positive energy circulating our homes. The bedroom is one of the most important places in a house or an apartment. This is where people relax and recover, it is also the place for intimacy between lovers or spouses. Naturally, achieving feng shui bedroom balance is of uttermost importance for improving sleep quality and getting the most of your relaxation hours. A good feng shui bedroom is the one that emits harmony and sensual energy. The sources of energy in the bedroom are of uttermost importance. We are all used to having a TV set right across the bed but the philosophy teaches that such devices disturb the balance in the room. TVs and computers are able to produce powerful energy waves, which disturb sleep and can cause anxiety. Turn the bedroom in a place for relaxation, rather than in a multimedia hall. A TV will keep you entertained but it can actually cause more harm. The position of the bed is another important aspect to consider. Since feng shui is all about balance, the bed should be equally accessible from both sides. Sticking it in a corner or placing the bed underneath a window is not the best option. Put the bed next to a wall, so that it stand behind the heads of the sleeping people. The wall provides support and comfort and will make the sleep of people in this bedroom better. When buying furniture and decorations for the bedroom, it will be best to get sets of two. Two mirrors, two bedside tables and two bouquets of fresh flowers will add to the bedroom balance and will symbolize that this place is dedicated to two individuals. Get rid of objects you dislike or the ones that provoke negative sentiments. One of the biggest mistakes you can commit is displaying a piece of furniture just because it is fashionable. Edges and corners are a source of negative energy, according to feng shui. To minimize their influence, select pieces that have more curves than edges. Color selection can also help you achieve balance in the bedroom. Refrain from painting in aggressive colors like black or red. These colors are sexual but should be used only as decorations or occasional patterns. Select pastel shades and colors that are typical for nature. 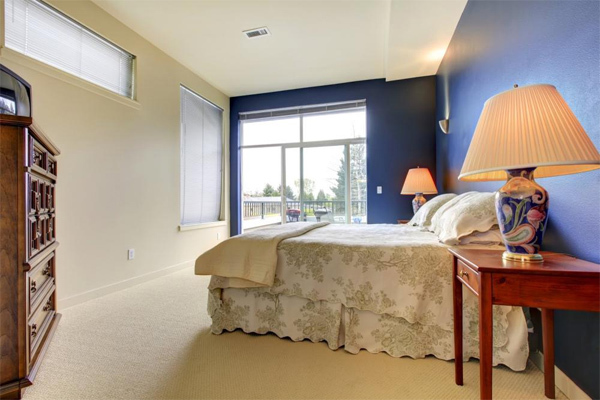 Blue, green, beige and earthly tones are most appropriate for a bedroom. They will both inspire you and create tranquility in the room. Feng shui bedroom balance is all about the right colors and bringing them together in a harmonious way.